It will soon be illegal in Halifax to use pesticides on your lawn. Here are suggestions and solutions to a lovely, green garden in a pesticide-free HRM. What gardener hasn't spent several back-breaking hours bent over their lawn, trying to wrench out every last fluffy-headed dandelion from its roots before they spread further afield? With the recent province-wide ban on "non-essential" pesticides, announced last March and set to be implemented next spring, many gardeners may be scratching their heads and wondering just how they're going to win the war on weeds in a post-pesticide world. Fear not, Haligardeners! There are plenty of resources in the city to help you survive the pesticide freeze and make your thumb---and your garden---greener. Many community gardeners in the city have been gardening pesticide-free for years. 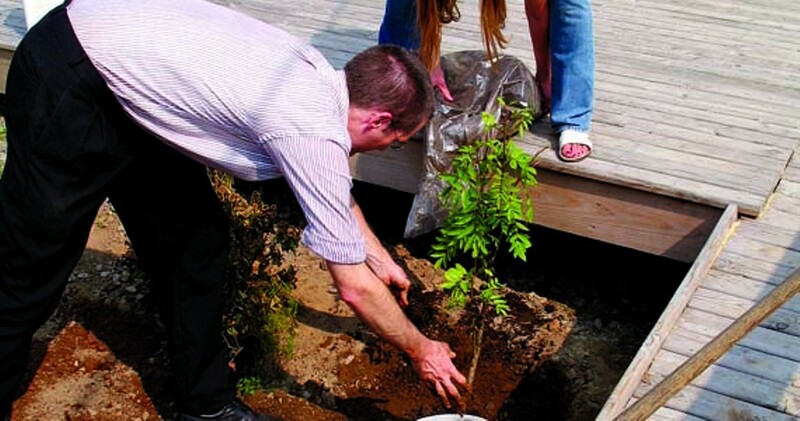 The Urban Garden Project is a great way to connect with gardeners in the city and learn from their collective experience and knowledge. This summer the project coordinators will be hosting a workshop series called Roots & Shoots, working with different community groups and organizations to share skills and build new resources. Sign on to the gardenhalifax email listserve through halifaxgardennetwork.com, which also lists upcoming events and workshops. For a glimpse of pesticide-free gardening at its finest, visit either of the two gardens managed by the Urban Farm Museum Society of Spryfield. The society produces a planting guide for Nova Scotia's climate, and president Marjorie Willison's book, East Coast Gardening, contains valuable tips for organic gardeners. Their website also offers an electronic forum for gardeners to share tips and tricks. With a busy season planned, gardeners young and old are welcome to come learn, plant and share. This self-proclaimed "voice of organics in Atlantic Canada" has operated since 2000 as the advocate for organic agriculture in the region. Not only does it offer a directory of organic food producers in Atlantic Canada, it also hosts workshops, a database of allowable organic inputs, information on how to fight Maritime pests and weeds, training programs and more. The See More Green collective garden, tucked into a quiet area behind buildings on the Dalhousie Campus, offers workshops on most Tuesday evenings. The group has a number of sessions planned for this season, including What Weeds Mean in Your Soil (June 22). All ages and ability levels are welcome. Ecology Action Centre: Go Wild! One of the easiest ways to fight the war on weeds pesticide-free is to---gasp---get rid of your lawn. By doing this and choosing plants that are native to our particular area, you'll find you spend much less time pulling weeds, and much more time pruning back your lush garden and enjoying the results. The Ecology Action Centre's Go Wild! website has information on how to convert your lawn into a sustainable garden, and can connect you to native plant gardeners, provide suggestions on popular Nova Scotian plants and more. Tune in to News 95.7 FM for The Weekend Gardener with Nikki Jabbour. Jabbour is a wealth of information about the particular challenges of gardening in Atlantic Canada, and each week her show features a wide range of gardening from across the country. By tailoring your garden to the specific climate of Nova Scotia, you'll find your garden thriving, happily pesticide-free. Elizabeth Peirce's Grow Organic: A Simple Guide to Nova Scotia Gardening, is a must-read if you'd like to grow your own organic vegetables. Written with the Maritime climate in mind, it gives advice about our particular growing season, what vegetables grow best, where to find organic seeds and instructions for canning your produce for winter.